Last week, we shared our passion for helping others with Passports with Purpose. We’re part of a large community of travel writers hoping to raise $100,000 to bring clean water to Haiti. 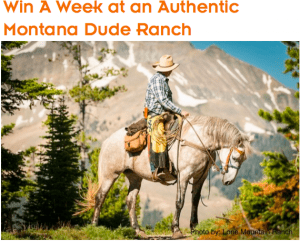 You can read all about it here and buy your raffle tickets to win a week long stay at a Montana Dude Ranch or a 3-day Big Sky Montana and Yellowstone Adventure. The perfect Christmas gift for the family who is always getting lost, win a Garmin Nuvi GPS (with lifetime maps & traffic updates!) from Frisco Kids. 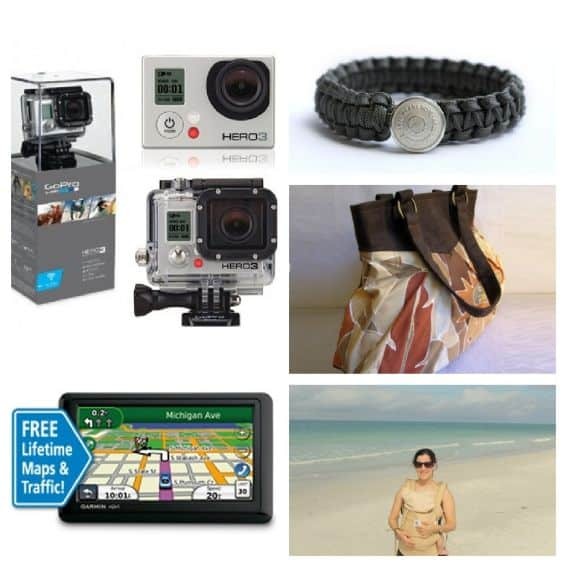 If you are looking for a professional quality HD video & 5MP camera, be sure to enter for the GoPro HD Hero 3 camera offered by Solo Traveler. My favorite perk: it’s completely waterproof for all your adventures! A lifesaver while traveling with small babes and children, the Ergobaby Carrier is a phenomenal product to utilize for years. I might still be using mine for my 3-year-old. You can read all about the carrier here on Arrows Sent Forth. Wandering Tastes is offering a gorgeous swag bag full of fair trade products from around the world including beautiful scarves, necklaces, bags, coffee, geography sets, and more. 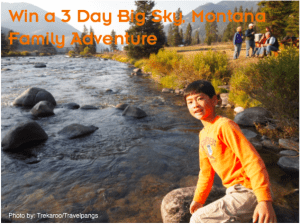 These prizes are perfect because they are so flexible- a must in family travel planning! Loyalty Traveler is offering up 110,000 Hyatt Gold Passport points, valid anywhere in the world. Depending on the resort you choose, that could be good for 5-22 nights! Families love staying at Hilton Garden Inns across the United States, Canada, and Europe- you can win two nights lodging at any Hilton Garden Inn from Travel Mamas. 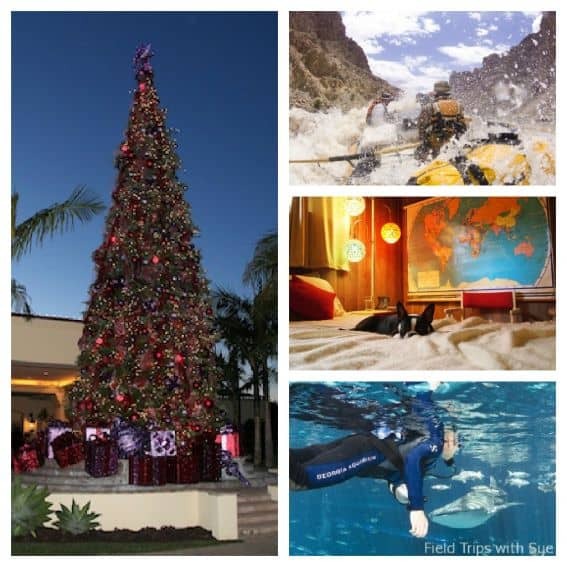 Kimpton hotels is also joining in the fun; The Mother of All Trips is featuring a 3-night stay at any Kimpton hotel in the United States AND a gift certificate for dinner! Stay one night in a family suite at any Great Wolf Lodge, including breakfast, lunch, and dinner for four (thanks to Adventures by Daddy). Another great flexible opportunity is being offered by All Over the Map. Enjoy a $1000 voucher to use at HomeAway’s 350,000 vacation rentals worldwide. My family just returned from a vacation secured with HomeAway; it was the perfect home-away-from-home-getaway! Our friends at Pit Stops for Kids are offering up a one-night luxury stay & dinner at the Ritz Carlton Laguna Niguel- the resort is heavenly and an amazing getaway. Experience the Omni CNN Center and even an exclusive swim with whale sharks from Field Trips with Sue. You & your loved one can win a 6-day whitewater rafting adventure on the Colorado River through Utah with Wanderlust and Lipstick! If you can’t part with your pooch for your getaway, enjoy a dog-and-kid-friendly weekend on the Mendocino Coast thanks to Ever in Transit. These once in a lifetime experiences are just waiting for your family to enjoy. Ciao Bambino is featuring a 7-night vacation at Inspirato’s Las Olas residence in Mexico; this penthouse has a private pool and sleeps 6 people! Wanderlust and Lipstick is also featuring a Mexico giveaway: five nights for two at the Banyan Tree Mayakoba on the Riveria Maya. 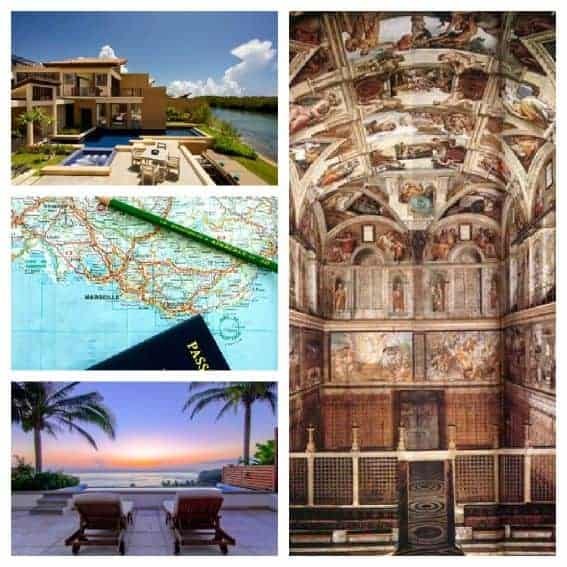 Europe can be in your family’s future if you enter to win 2 nights in Rome, including a Vatican tour and pizza making class from Revealed Rome. Want to stay a bit longer? Win a whole week at a villa in Provence including meals, guided tours, and of course a hearty sampling of the region’s famous wines. The Provence Post knows Provence & this is one amazing getaway, with the kids, or without. Tell your friends using the share features in the column to your left! Fundraiser ends December 11, 2012 at 11:59 PM PST. Great round up of some truly incredible prizes for an amazing cause. Thanks for putting this together! It’s a great visual to go with the prizes.